In this Blooom Review, we’re going to show you the details of how Blooom works, what services it offers for investors, and whether using Blooom to manage your 401(k) is the best choice for you. Understanding if you’re on track with your retirement savings is tough. Tracking down a trustworthy financial advisor and making time to meet them is even tougher. Those are the problems that Blooom aims to solve. 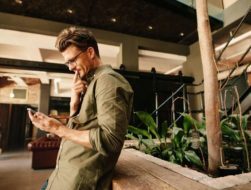 If you want to automate the task of analyzing the 411 on your 401(K), take a look at the pros and cons of their service below. Bloom Review: How Does Blooom Work? What Are the Drawbacks of Blooom? Customer Reviews of Blooom: Who is Blooom a Good Fit For? 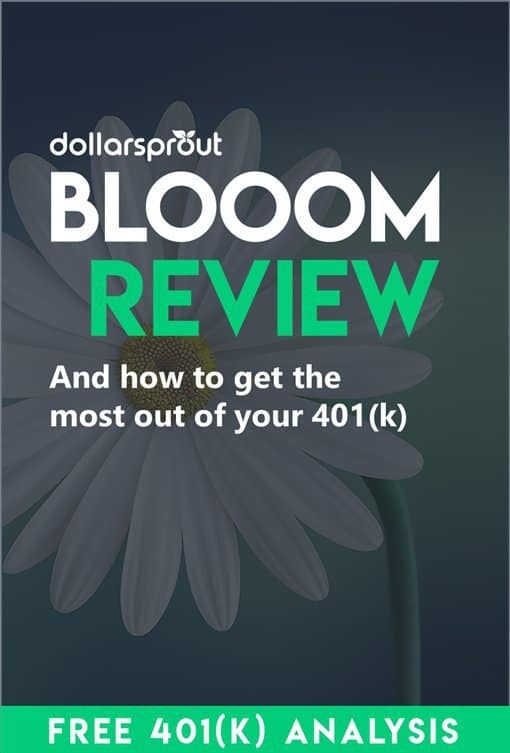 The Bottom Line: The name of the game with Blooom is optimization, or “a whole new way to 401(k)”, as they claim. Blooom can also be used for 401a, 401k, 403b, or 457 accounts. Best For: Blooom is best for young professionals who want a free, digital review of their retirement portfolio and/or a flat-fee robo-advisor to help get or stay on track with retirement savings. Read Enough? : The Blooom login is right here if you’ve heard enough and you’re ready to get started. If not, keep reading for all the details! 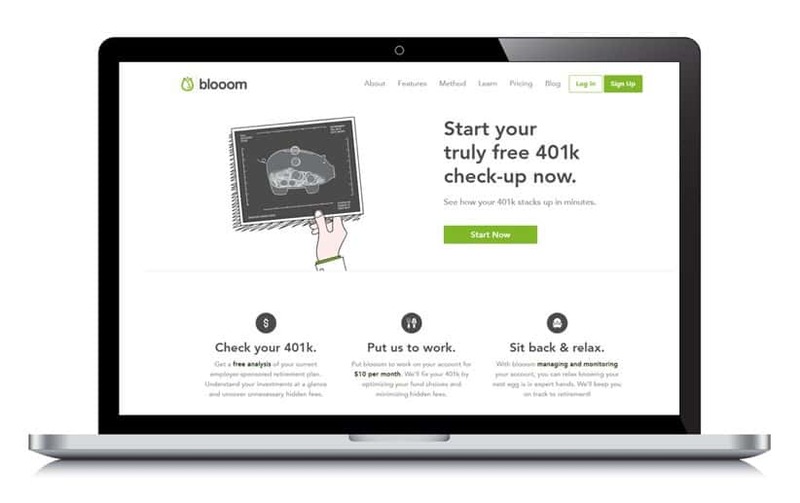 Blooom is a robo-advisor focused on optimizing your 401(K) or other retirement savings accounts. The basic premise behind the service is that most of us have a 401(k) with our employer, but very few people are utilizing their account to the fullest. Blooom aims to help people get more out of their retirement accounts. It was founded by three friends (Randy, Kevin, and Chris) who wanted to make it easy for anyone to get access to professional investment advice, regardless of how much money they’re investing. At the time of creation, two of the founders were working in money management, essentially helping the rich get richer. Realizing their own parents probably couldn’t even afford their services, they knew they wanted to fundamentally change who they were helping every day when they got out of bed. Now, they’re working towards helping Americans across the USA make smarter investments. In early 2017 when they raised $9 million in private equity funding, Blooom had over half a billion dollars under management. As of this writing, they have over $2 billion under management, so they are growing quickly. Compared to industry leader Betterment at $13.5 billion under management, Blooom is still relatively small. However, they’ve been named one of the most innovative companies in the world by Fast Company and are expanding their customer base rapidly. Our Bloom review would be incomplete if we didn’t share how it works. Blooom helps its users by reducing fees hiding in existing investments, adjusting investments for retirement savings needs (portfolio rebalancing), providing humans for advice, monitoring accounts for suspicious activity including fraud or hacks. One of the most intimidating things an average investor has to do is pick where to put their investments. Blooom helps clients by facilitating that process of selecting the right type and allocation of investments. Their system is built on an algorithm modeled upon “decades of market data.” Index funds are a large part of their investment strategy to keep fees low for clients. Hidden fees are something that could be cannibalizing your retirement savings by cutting into investment returns. If that seems a bit dramatic, consider that paying a 1% annual fee could cost you over half a million dollars, by some estimates. According to Nerdwallet, a 1% fee could cost millnennials $590,000 over the course of their investing lifetime! Blooom makes sure your hidden fees stay as low as possible (and hopefully well below 1%). Rebalancing and investment selection are intrinsically linked activities (read: rebalancing can be just as perplexing as picking the first time around). Although they don’t provide a great deal of specifics about how they formulate (“bang out,” in their words) portfolio recommendations, they automatically adjustment your mix of stocks and bonds to keep you on track with goals over time. They particularly pride themselves on using a model which takes your risk tolerance into account, not just retirement date. Blooom helps clients map out a plan for their retirement account and plan for the inevitable ups and downs the market will bring. Moreover, they are aware that we’re all susceptible to freaking out when market downturns happen — and they seem to proactively help their clients manage this fear by advising how to respond in those tumultuous times. Many robo-advisers have recently adopted a blended model, using both humans and algorithms to help their clients. Blooom is using a similar approach. As a fiduciary, they are ethically and legally bound to put your financial best interests ahead of their own. Considering buying a new house? They welcome you to get in touch to talk with an adviser to make smart financial decisions, even when it isn’t about your 401(k). Blooom boasts their safeguards to keep “sneaky people out of your hard-earned savings” using account monitoring services to watch for large withdraws or suspicious activity. They use 256-bit data encryption, authentication protocols, and more. If they see something dodgy, they’ll text or email you as an alert. Blooom offers analysis for free, no strings attached. That includes a review of hidden fees, a diversification overview, and recommendations for rebalancing your portfolio to ensure you’re on track for retirement goals. 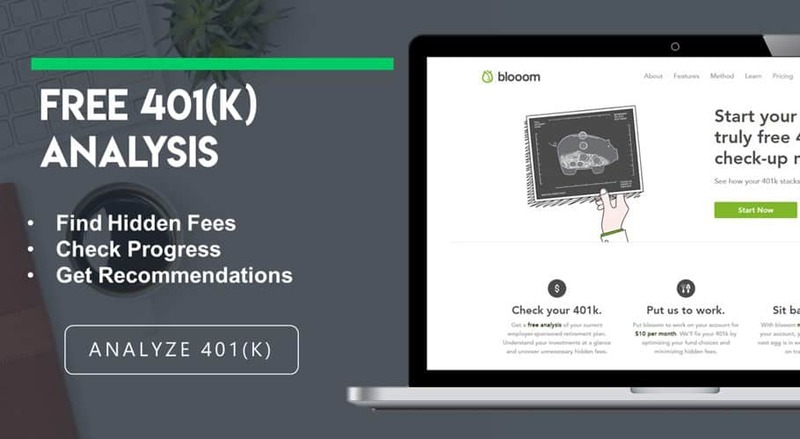 After you do a free 401(k) analysis and Blooom provides recommendations, they essentially say “hey, we can take care of everything for you from now on for just $10 a month.” Regardless of account size, Blooom charges a flat $10 monthly fee for managing your account. However, they do offer a 10% discount for paying annually for a net savings of $12. Of course, there are no obligations whatsoever to have Blooom manage your 401(k). The free analysis tool truly is free. Passive Index Funds and Active Management are strange bedfellows. Index funds are a wonderful choice for the average investor because of their low fees and minimal activity required on the part of the investor. These funds are also highly accessible for purchase by individual investors with a little bit of research. However, if you don’t even know where to begin, the value of Blooom boils down to helping you pick which index funds to invest in and when to shift portions of your portfolio over time. Target Date funds offer a similar service. However, on balance, the other perks Blooom offers (access to advisers by chat; analysis tools) add value. Take-away: This weight of this drawback depends on your level of comfort with investment selection and balancing. It may take time for Blooom’s low-fee model to actually cost less than competitors. According to our calculations, you may need upward of $20,000 in retirement assets with Blooom before their $120/year fee becomes a smaller percentage of your assets than competing Target-Date Funds charge. For example, for Blooom to cost less than Fidelity Freedom Funds charging .67% of assets under management, you’d need to have a nest egg of $18,000 ($120 divided by $18,000 is .67). Take-away: The amount in your portfolio is a relevant consideration in whether Blooom is a good fit for you. They can’t run investment changes by you first, don’t specify when rebalancing happens, and they sometimes select actively managed funds to round out portfolios, increasing back-end fees. Details about this are scarce on the site, so we’re left wondering what triggers periodic rebalancing and how much say you have in the details. Take-away: For many people, it’s a huge pro (not a con) that they don’t have to make decisions. However, if you want a moderate level of ongoing input on your portfolio, these represent meaningful limitations. Newly minted professionals who are new to investing and need a (digital) partner to get started should check out Blooom. At the other end of that spectrum, professionals with over $20,000 in retirement savings can lower their fees by moving their portfolio management over to Bloom. Betterment may also be worth looking into if you fall into either of these categories, depending on your specific needs. Consumers who want an exceptionally good rate for access to a financial planner are also a good fit. The average financial planner charges $100+ per hour, so $10 per month to engage by chat is a dream come true. If you’ve been in a fog of doubt, fear, or uncertainty about what is going on with your retirement accounts, Blooom may be a great solution for you. Their free tool is worth checking out, if nothing else. Beyond their free report, signing up is relatively simple given you do not need to roll over accounts from where they are currently held. Instead, you’ll give discretionary management access to their team of professional financial advisers to make investment selections and rebalancing decisions on your behalf. In summary of this Blooom Review: The founders of Blooom are out to democratize retirement planning and we are on board for that!